Gary Wolstenholme reviews the prime, wide-angle Canon EF 24mm f/2.8 IS USM lens. This brand new wide angle prime lens from Canon sports a fast f/2.8 maximum aperture, an ultrasonic focus motor and image stabilisation. This lens is currently available for around £750. Is it really worth the expense? 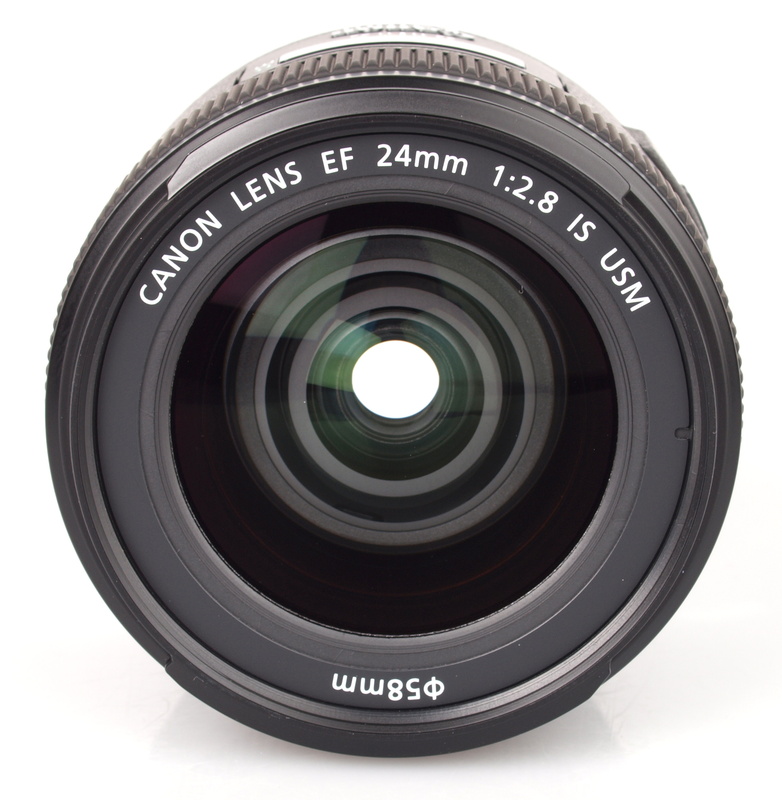 The lens shares the same design as many of Canon's latest higher-end consumer grade lenses, with the barrel being constructed from high quality plastics, accented with a silver ring and finished with a metal lens mount. Overall the lens has a high quality feel to it and the use of plastics has kept the weight down to a travel friendly 280g. When mounted on the Canon EOS 5D MkII used for testing, it makes a nice compact combination. An Ultrasonic motor powers the autofocus, and focusing is fast as a result. Manual focus adjustments can be made at any time, whether the lens is set to AF or MF. 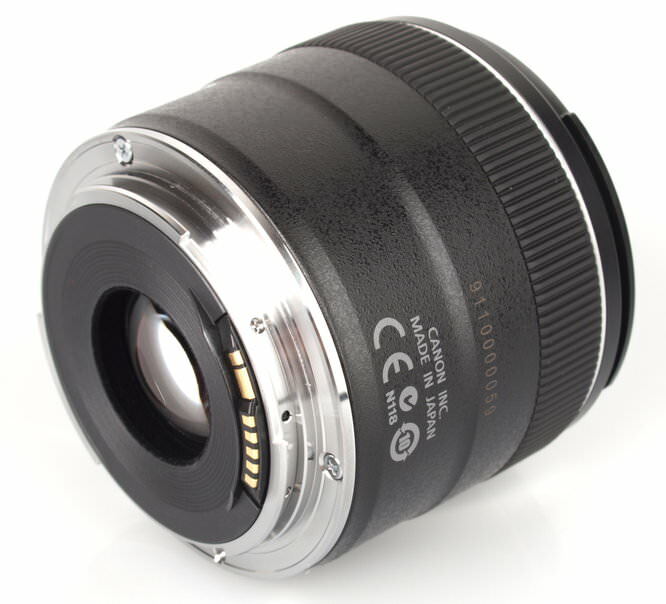 The focusing ring is smooth and has a well damped feel to it. As a result, fine adjustments are easy to apply at any time. Focusing is performed internally, which means the 58mm filter ring doesn't rotate. This is ideal for use with graduated and polarising filters. Closest focus is 20cm, which is great for shooting in cramped environments and even for the occasional close up image. Including image stabilisation on a wide angle lens like this is an interesting approach. Saying that, with care, sharp hand held images are possible around half the time with shutter speeds as low as 1/6sec, which is around three stops slower than the usual rule of thumb would allow. Having this ability to hand hold for long shutter durations opens up all sorts of creative possibilities for long exposures in low light conditions. As far as sharpness is concerned, this lens delivers excellent performance, even at f/2.8. At maximum aperture, sharpness in the centre of the frame is already excellent, and the clarity towards the edges of the frame is very good. Stopping down improves sharpness further with the centre being outstanding between f/4 and f/11 and the edges reaching similar levels of clarity between f/5.6 and f/11. Chromatic aberrations are well controlled, only just exceeding half a pixel width towards the edges of the frame with the lens stopped down to f/22. This low level of fringing should pose few issues, even in large prints, or harsh crops from the edges of the frame. Falloff of illumination towards the corners of the frame is very strong at maximum aperture. At f/2.8 the corners are 3.81 stops darker than the image centre and visually uniform illumination is achieved until the aperture is stopped down to f/8 or beyond. 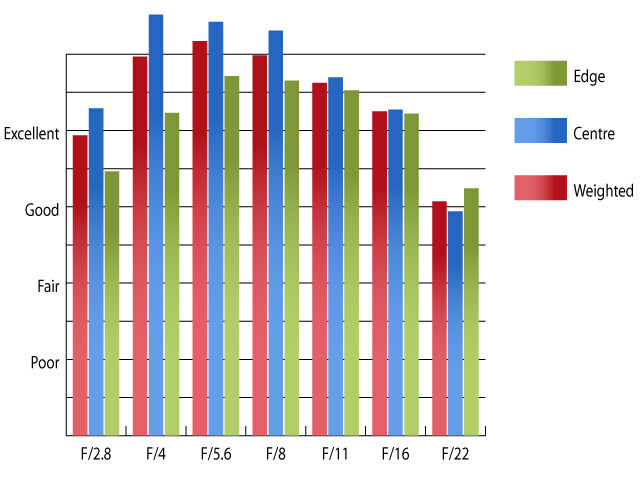 Only a mild level of 1.22% barrel distortion is present and the distortion pattern is uniform across the frame, which should make it relatively straightforward to correct in image editing software afterwards. No lens hood is supplied as standard by Canon, which is a shame. Bright light sources in the frame can cause flare, and loss of contrast, so it would've been good of Canon to include a hood to help reduce this. An EW-65B lens hood will set you back an eye-watering £47. For that price you'd be forgiven for expecting it to be made from carbon fibre, or titanium... it's not. This lens certainly isn't cheap at around £750. You'd be forgiven for thinking that a prime lens with a maximum aperture of f/2.8 would be priced more keenly, with or without image stabilisation. 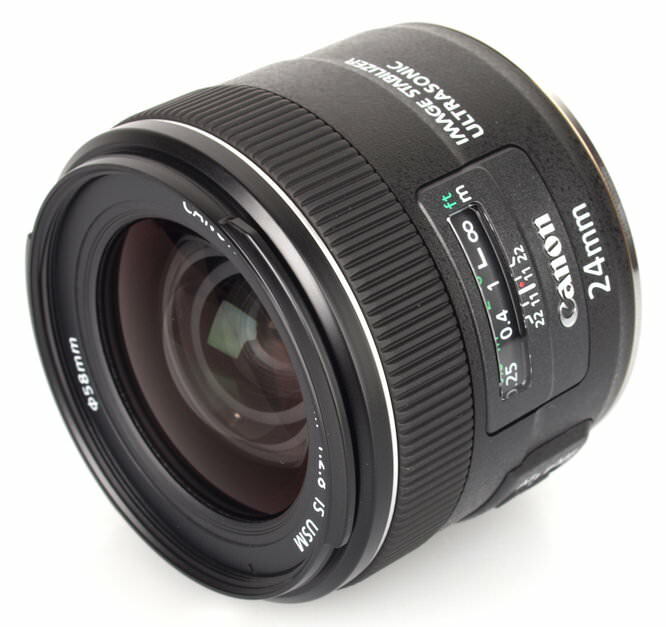 Saying that, it is around half the price of Canon's 24mm f/1.4L, which has a faster maximum aperture that is four times faster, but no image stabilisation. Third party offerings at the same focal length include Sigma's 24mm f/1.8 EX DG. Although this lens lack silent focusing and image stabilisation, it does have a faster maximum aperture and can be picked up for around £430. Samyang's 24mm f/1.4 is another alternative. This lens has a fast f/1.4 maximum aperture, but lacks autofocus, image stabilisation and any electronic coupling with the camera. It can be bought for around £500 though. On paper, this lens has a lot going for it. It's sharp, well built and has image stabilisation to help tame blurring due to quivery hands. Given the reasonably modest maximum aperture, for a prime lens, the price seems quite steep (for purposes of comparison, Nikon's 24mm f/2.8D costs around £365). Maybe it will come down as supplies of the lens become more readily available? Even if it does, having to pay nearly £50 for a hood to help tame flare leaves a bitter impression. Obviously a quality lens, but the price is taking the piss. And no lens hood either. What are Canon marketing dept doing? It's the same with the new 24-70L IS which is £2000+ and at the same time they're discontinuing the older non IS lens at half the price. Time was when Canon lenses were cheaper than their Nikon counterparts but Canon are getting greedy. 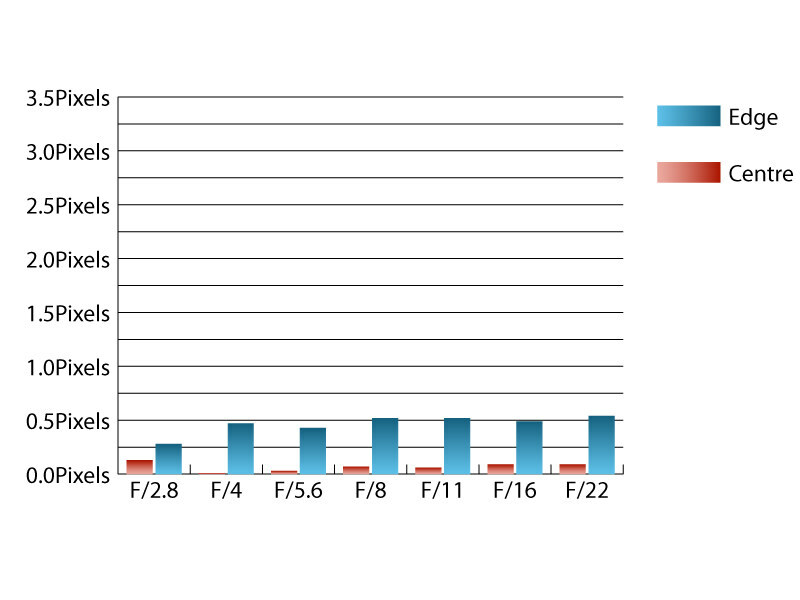 Half of me hopes Canon get killed by the D800 so that it forces them to get their act together on pricing. Obviously a quality lens, but the price is taking the piss. And no lens hood either. What are Canon marketing dept doing? It's the same with the new 24-70L IS which is £2000+ and at the same time they're discontinuing the older non IS lens at half the price. Time was when Canon lenses were cheaper than their Nikon counterparts but Canon are getting greedy. 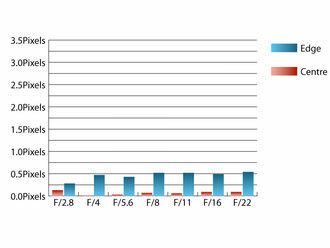 Half of me hopes Canon get killed by the D800 so that it forces them to get their act together on pricing.